Charles Woodward Hutson, at the time of his retirement, had trained as a lawyer, served as a Confederate soldier, a university professor, and was a critically acclaimed artist. Charles Hutson, a Southern artist, writer and academic born in South Carolina on September 23, 1840, moved to New Orleans in 1908 after he retired from the faculty at Texas A&M University in College Station. Before retiring at age sixty-seven, he had trained as a lawyer in South Carolina, been wounded as a soldier in the Confederate army, and had established his reputation as a scholar and historian, a writer for periodicals, a book editor, and a professor at colleges and universities in Georgia, Kentucky, Louisiana, Mississippi, North Carolina, and South Carolina. 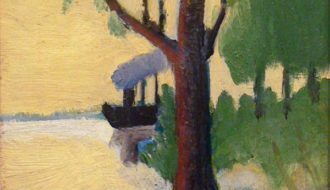 In 1905, while teaching in Texas, he began to sketch in pastel, initiating the explorations in the art world that marked the last three decades of his life in New Orleans and on the Mississippi Gulf Coast. Hutson’s early twentieth-century art forms never fit easily into traditional categories, yet he has been described by a number of curators and scholars and exhibited as a self-taught artist. Others, however, have described him as a “visionary artist,” a “proto-modernist,” even an early modernist. 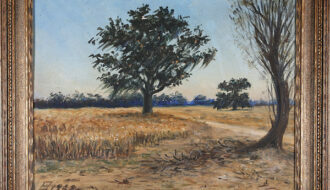 Adding to these issues is the fact that he rejected formal art training, including offers of lessons from his daughter, the accomplished artist and arts administrator Ethel Hutson, preferring to explore his own vision and develop his own techniques, working first in pastels, then watercolors, and finally in oils. Unlike many, however, who are categorized as self-taught artists, Hutson was far from uneducated, as reflected in his four decades of serving as a professor of Greek, French, and Latin, as well as literature, history, and philosophy. When he moved to New Orleans with his family in 1908, it was actually a return to Louisiana; Hutson first came to Baton Rouge, from his native state of South Carolina, after he was hired to teach Greek at Louisiana State University. It was there that he met his future wife, Mary Jane Lockett. Ethel Hutson, the first of their nine children, was born in Baton Rouge in 1872, and spent much of her later professional career working in the New Orleans art world—and advancing her father’s reputation. Hutson’s art was influenced by his wide-ranging experiences in the nineteenth-century South, building upon his family’s significant place in South Carolina history, which included a legacy of planters, pastors, lawyers, and legislators. (It is reported that his father, William F. Hutson, drafted the articles of secession for South Carolina, and was a signer as well). The life of Charles Hutson evolved, in some ways, like those described in nineteenth-century Southern literature. Beginning with his experiences in the Confederate army, he was injured at the Battle of First Bull Run, captured at the Battle of Seven Pines and held as a prisoner, and then mustered out after the surrender in 1865. Initially planning to return to become an attorney like his father, he became instead an itinerant academic, moving across the region with his growing family as the South rebuilt after the war. Before he moved to New Orleans, the range of Hutson’s research and writing interests were reflected in the titles of his publications, including The Beginnings of Civilization (1891), A History of French Literature (1889), and The Story of Language (1897). In retirement, Hutson continued his research, writing, and editing activities, and also explored the works of Lafcadio Hearn. He edited and published Hearn’s writings in Fantastics, and other Fancies (1914) and Lafcadio Hearn, 1850–1904 (1926). Yet increasingly, Hutson focused on art, encouraged by his daughter. He sketched scenes from around New Orleans, especially in his Uptown neighborhood and on regular trips to City Park, creating characteristic images of the city and its natural environment. He also painted works inspired by his studies of Shakespeare, with titles reflecting the importance of these works to him. Hutson became an easily recognized figure as he wandered across New Orleans, marked by his formal attire, long white hair, and flowing beard. Family legend has it that a neighborhood child stopped Hutson and asked him, “Are you God?” In addition to New Orleans, he spent a significant amount of time in Biloxi and Pearlington, Mississippi, and traveled regularly along the Mississippi Gulf Coast, finding inspiration for his art in seaside environments, specifically in the flora and foliage of the Gulf region. His visionary art forms seem to have anticipated the evolving art of the modern and contemporary eras, and he achieved some recognition for this art during his lifetime, including being exhibited by the Society of Independent Artists in New York in 1917. 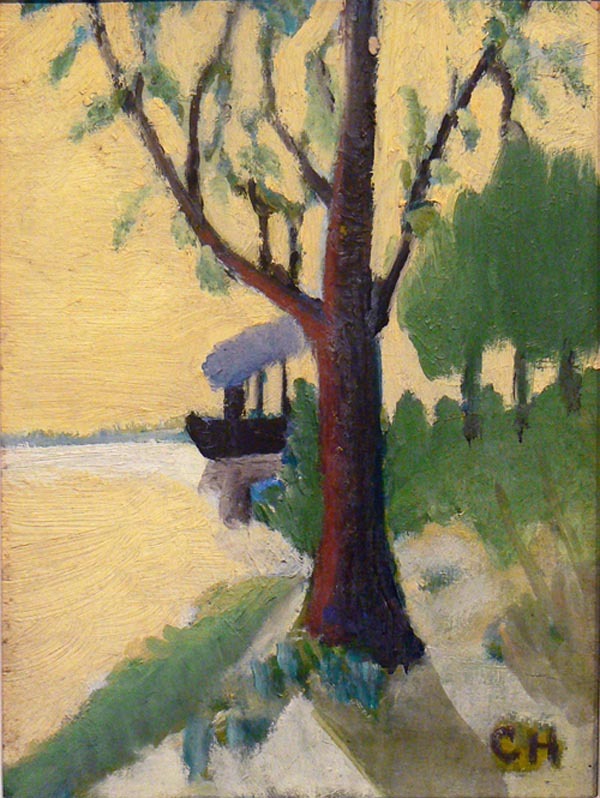 When he was ninety-one years old, in 1931, Hutson was given the first one-man exhibition at the Delgado Museum of Art (now the New Orleans Museum of Art). Hutson died in 1936, yet his reputation continued to evolve. Noted curator and dealer Sidney Janis included Hutson in his landmark 1942 book They Taught Themselves: American Primitive Painters of the 20th Century. After he was featured in an exhibition of self-taught artists at the Phillips Collection in 1945, Duncan Phillips purchased several of Hutson’s works for the collections of his modern art museum in Washington. The Delgado Museum of Art presented Charles W. Hutson, 1840–1936: A Retrospective Exhibition, accompanied by a full catalogue, in 1965. More recently, in 2008, the Ogden Museum of Southern Art organized an exhibition devoted to the works of Charles and Ethel Hutson, and in 2010 his paintings were exhibited at the Edward Thorp Gallery in New York City. Today Hutson also is recognized as the patriarch of a multigenerational family of Louisiana artists and designers (who call him “Papa Hutson”), including Ethel Hutson, Patricia Whitty, Charles Trapolin, and Peter Trapolin. Gruber, PhD, J. Richard "Charles Woodward Hutson." In https://64parishes.org Encyclopedia of Louisiana, edited by David Johnson. Louisiana Endowment for the Humanities, 2010–. Article published September 12, 2012. https://64parishes.org/entry/charles-woodward-hutson. Charles W. Hutson, 1840–1936: A Retrospective Exhibition. New Orleans, LA: Isaac Delgado Museum of Art, 1965. Charles Woodward Hutson Papers, 1765–1949 (Collection Number 00362), Wilson Library, University of North Carolina, Chapel Hill. Hutson, Charles W., ed. Fantastics, and Other Fancies. Boston, New York: Houghton Mifflin Company, 1914. Janis, Sidney. They Taught Themselves: American Primitive Painters of the 20th Century. New York: Dial Press, 1942.